The Proven Benefits of Myrrh - Do they exist and how do they affect us? What are the benefits of myrrh? Along with Frankincense, Myrrh has been known to humans for its beautiful essence and and healing properties for thousands of years. 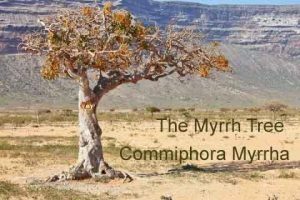 Myrrh is a resin derived from the tree known as Commiphora myrrha (the Myrrh Tree), and which is common in Africa and the Middle East. The myrrh tree is adapted to arid desert conditions and like many such trees, can have a contorted and seemingly tortured appearance. As with all harvesting of resin, the bark is cut open to release the substance, which is then permitted to dry as it seeps down the trunk having the appearance of tear drops. Most of us first became aware of Myrrh when we heard the biblical tale of the three wise men bringing gifts of Frankincense (to which myrrh is botanically related), Gold and Myrrh to the birth of Jesus the Christ. Of these gifts, myrrh was recognized as the anointing oil of kings. It has been used throughout history as a perfume, incense and medicine. It can also be ingested by mixing it with wine and is mentioned in the Old Testament as a very rare and intoxicating perfume. It’s quite possible that the ancients got ‘high’ on this substance. Myrrh is used as an antiseptic in mouthwashes, gargles, and toothpastes Myrrh is currently used in some liniments and healing salves that may be applied to abrasions and other minor skin ailments. Myrrh has also been recommended as an analgesic for toothaches, and can be used in liniment for bruises, aches, and sprains. Myrrh is a common ingredient of tooth powders. Myrrh and borax in tincture can be used as a mouth-wash. A compound tincture, or horse tincture, using myrrh is used in veterinary practice for healing wounds. 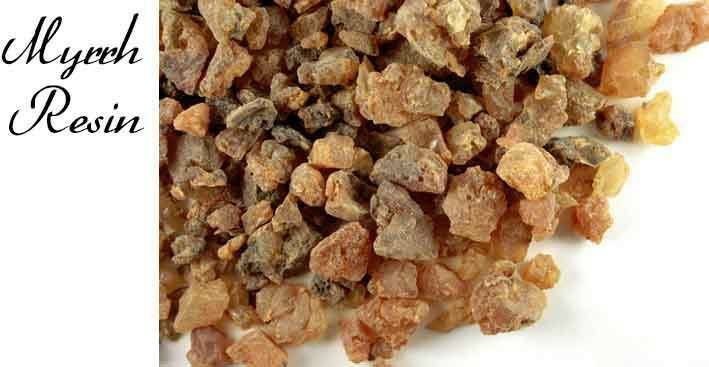 Meetiga, the trade-name of Arabian Myrrh, is more brittle and gummy than that of the Somalian variety and does not have the latter’s white markings. Liquid Myrrh, or Stacte, spoken of by Pliny, also an ingredient of Jewish holy incense, was formerly obtainable and greatly valued but cannot now be identified in today’s markets. 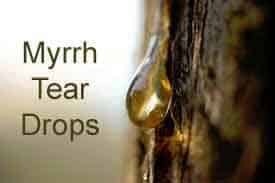 Myrrh gum is used for indigestion, ulcers, colds, cough, asthma, lung congestion, arthritis pain, and cancer. The article below is an extract from the original on DrAxe.com (full credit and link below the article). We hope you enjoy it. The most common historical myrrh oil use was to burn the resin over hot coals. This would release a mysterious, spiritual presence into any room before a religious ceremony. It has also been used in aromatherapy for its meditative quality or for prayer, usually in combination with frankincense. The smell of myrrh has been traditionally seen as a symbol of suffering, burned at funerals or other sad events. But, at times myrrh is blended with citrus oils to help produce a more uplifting aroma. These lighter blends have been used to help promote inspiration and emotional insight. Generally, oils are inhaled, sprayed in the air, massaged into the skin, and at times taken by mouth. Fragrances are strongly connected to our emotions and memories as our scent receptors are located next to the emotional centers in our brain, the amygdala and hippocampus. The article above has been extracted from the Dr. Axe Website and remains their property. For the full article click on the link provided.